"A lot of women do not take time for themselves," explained Tracie Stuckey-Arana, BS, RT(R)(M), Breast Imaging Supervisor at Nevada Cancer Institute (NVCI), Las Vegas, NV. "They are so busy taking care of their families, their homes, and their jobs that they themselves become an afterthought." NVCI, whose motto is "Hope Thrives in the Desert," wants to help change these statistics. To that end, NVCI, with the support of several community partners, is rolling out the Hope Coach, a mobile mammography van. 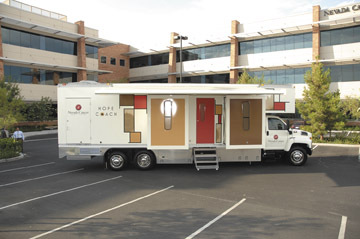 This specially designed imaging facility on wheels will visit job centers, works sites, and other venues throughout the Las Vegas area to bring breast cancer screening to women who may not otherwise be able to undergo this essential exam. The Hope Coach (Figure 1) is nearly 13 feet high, 8 feet wide with pop-out side panels, more than 40 feet in length, and weighs >36,000 lbs. "The coach is so large that it requires a commercial driver's license to drive," said Stuckey-Arana. The vehicle, which runs on diesel fuel, can be plugged into an electrical outlet to power its interior systems or it can run off of its own diesel-powered generator. "We have a backup generator and a couple of air conditioning units as well," she continued. "As with all digital mammography systems, the detector is very sensitive, and it is important to watch your temperature factors; they can't increase or decrease too quickly. That's why we were very careful with the backup system, particularly for the times when the coach is not occupied." The inside of the van, said Stuckey-Arana "doesn't feel like you are in a van at all. It looks and feels like an office." The space is divided into several rooms (Figure 2), which were created with sound-minimizing walls for patient privacy and comfort. Near the entrance to the coach, there is a reception area and a pop-out area with two chairs and a video station. There is a changing area and the mammography room, as well as an additional room created for potential future use. "We put that additional room in so that it could be used for a laboratory draw station in the future," explained Stuckey-Arana. "Initially we won't be using it, but looking ahead, we may want to be able to perform some screening lab draws." 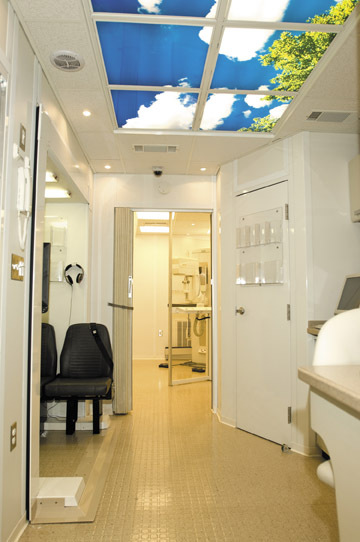 The custom-designed vehicle also features handicapped access through the use of a wheelchair elevator designed to bring patients directly into the mammogram room. "I've had several people comment when they came to look at the Hope Coach at how roomy it is compared with a typical exam room," said Stuckey-Arana. "We have more room in there because we took into account that we might need to allow for patients who come in in wheelchairs and we wanted to make sure that they would be comfortable." 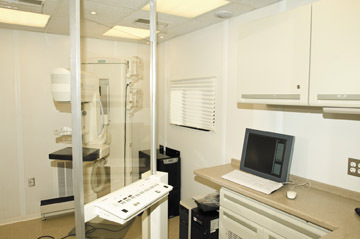 At the heart of the Hope Coach is the full-field digital mammography system: the MAMMOMAT Novation DR (Figure 3) from Siemens Medical Solutions (Malvern, PA). This state-of-the-art system features a flat panel detector built on amorphous Selenium (aSe) technology that enables the direct conversion of X-ray to digital information. The aSe detector technology provides high spatial resolution and excellent clinical detail. The combination of the proprietary detector technology and the unique X-ray tube allows for high-quality imaging with reduced dose exposure. The 24 × 29-cm detector panel is designed to image a wide range of patient breast sizes, while the compression paddle is designed for ease of positioning and for patient comfort. "We wanted the system on the coach to be digital," explained Stuckey-Arana, "and we already have a Siemens unit at the NVCI main office that we have found to be very easy to work with. I love that it's so fast and that I can see the images quickly. It also helps that we already have the Siemens' reading station at the main office, so configuring the Hope Coach to work with it was easy. I've also been pleased with Siemens' service, which, to me, is very important." To undergo screening mammography in the Hope Coach, women can either be referred by their physician or they can self-refer based on age. "Anybody over the age of 40 can self-refer for the mammogram if they have a doctor," noted Stuckey-Arana. "If they don't have a personal physician, we have a list of providers from which they can choose; often finding one who participates in their insurance." When a patient first arrives at the Hope Coach, she checks in at the front desk. "We are completely paperless," said Stuckey-Arana, "so when a patient checks in, we go to our electronic medical records. We've already registered her when she made the appointment." The patient then fills out a Mammography Questionnaire and is given a Patients' Rights and Responsibility form and a copy of the HIPPA form. Next, she views an educational video explaining how to properly perform a breast self-exam. This video is available in both Spanish and English. After that, she gets changed and the mammographer brings her to the MAMMOMAT Novation DR for the exam. When the exam is finished, the mammographer closes the study and immediately sends the digital images along with the questionnaire in an electronic format to NVCI's main office for interpretation. "We wanted to be able to send our images electronically to our main office so that they could be read in a timely manner," said Stuckey-Arana. "Most of the film-screen coaches, and even some of the digital coaches currently in use, hold the images and then upload them to their facility's main system when they return to their home base. We wanted to be able to send the images via the Internet or satellite so that they can be read quickly." "We also have a digitizer on board so that we can digitize prior films if the patient brings them in," continued Stuckey-Arana. "The digitized images are then transmitted electronically along with the most recent images for comparison. That's one of the important features that I really like." Once the studies are received at the NVCI main office, they are read and the images are stored on the facility's PACS. All physician reports and patient letters are sent from the central location, and patients receive their results in approximately 5 days. For now, NVCI plans to operate the Hope Coach, staffed with a front desk person, a mammographer, and, if needed, a driver, 5 days a week, 8 hours a day, and expects to perform up to 25 mammograms in each 8-hour shift. "For now, we are focusing on going to the workplace and providing the services at the place of employment," said Stuckey-Arana. "Nevada Cancer Institute wants to increase mammography screening rates so that for those women who do have breast cancer, we can catch it sooner when the cure rate is higher," she concluded. "We hope the Hope Coach will get out there and help more women to live with a diagnosis of breast cancer rather than dying from it. It's going to be a great thing for the community." Bringing Hope to the Women of Nevada. Appl Radiol.